A little more done on the saw bench this weekend. It is clearly going to serve as my go-to portable workstation. I have several jigs in mind to add as regular features but, for now, I’ve started by making a brand new bench hook. I brought it out into the driveway this afternoon to get a few photographs before it’s all scuffed up and broken in. The holdfasts are stored out-of-the-way by drilling a couple of holes in the legs. I placed them low enough that I can rotate them up to hold a board should the need ever arise. I know this cannot replace a proper bench but I am very pleased right now. 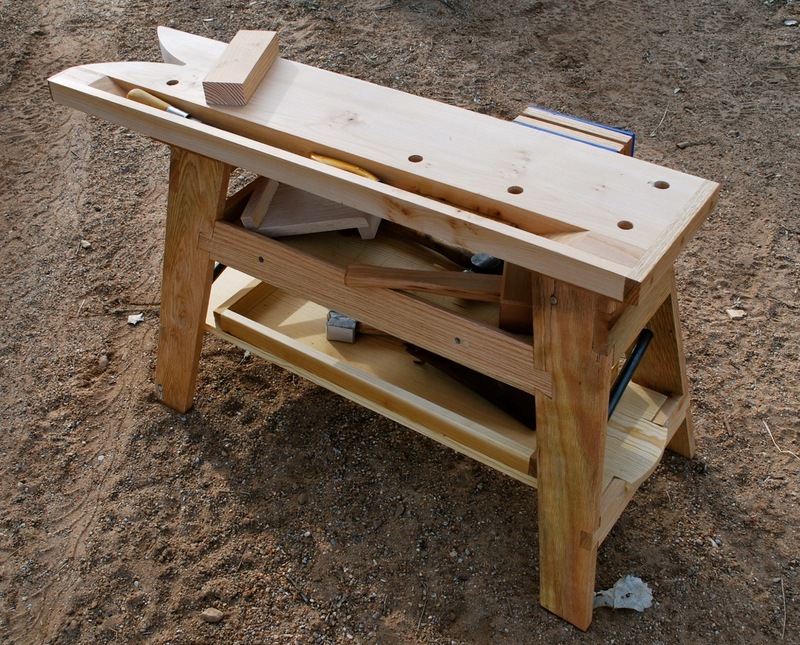 This will serve many functions, not the least of which is for bow and arrow making and as a leather work bench. 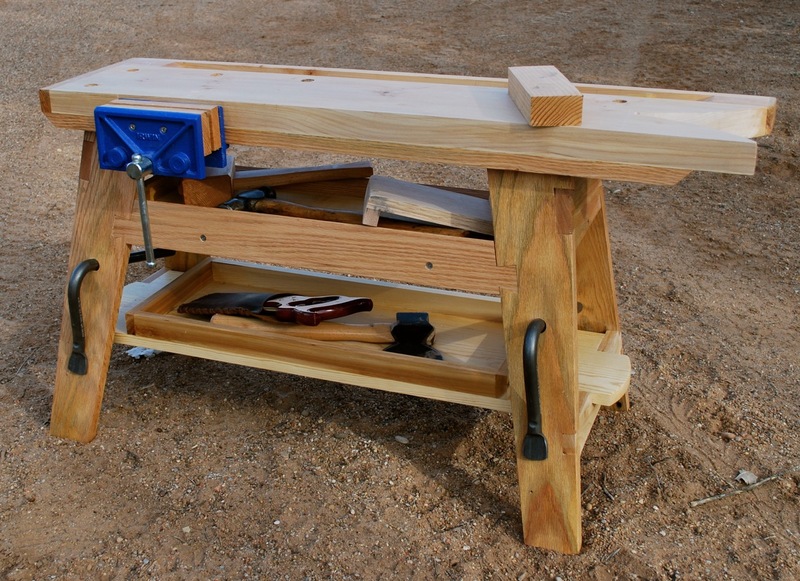 This, in conjunction with the shave horse and folding x-leg table (below), will need to serve as my portable workshop for the foreseeable future I’m afraid. Connection from leg assembly to the top. As for connecting the top, I used lag bolts with fender washers to provide a secure connection that could also be easily removed when the top is worn out. Bench hook on the bench. This bench hook is oak, glued with Titebond 2, and pegged with Osage orange dowels for added strength. The dowels aren’t visible in the fence as they are half-blind and stop just short of the surface. A bench hook, shooting board, mitre box, and other small jigs make great use of scrap that might otherwise end up in the wood stove. A final luxury to finish up this project; I’ve ordered a couple brass bench dogs (pups) and a bench (planing) stop from Lee Valley. I ordered the shorter version for the little bench. A bit extravagant for the littl ebench but they are reasonably cheap. 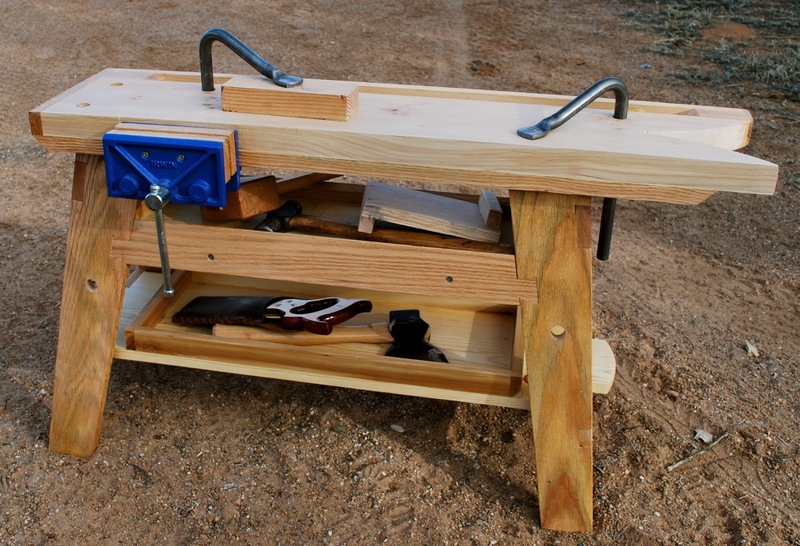 This sawbench is the match for the shave horse. Perhaps I didn’t make that clear anywhere. The old timers often had just a plain bench at the same height as their horse for big work or to hold tools, etc. I just got carried away. I don’t see why not. I was an apartment dweller for some time. My main workbench, other than the kitchen table, was a 4 foot 2 x 12 plank on legs cut from 2 x 12 as well. It was also a spare table, and a workout bench as needed. I am in need of an apartment (more like apartment hallway) workbench. Right now I hardly get by with working on the floor at night while my wife and son sleep or on rare occasions, i’ll have time outside with my very wobbly Workmate. Would love to build a full-size bench, but given space and $$ I think something like this would be great!!!! Do you have any shop plans, dimensions, or suggested wood? Any and all help is greatly appreciated. Thanks George. Hey George, truly enjoy your site and the links it promotes. The ideas and associated projects it prompts in me has given hours and hours of pure pleasure. The little table and bench I’ve seen in many of your photos is something I’d really like to copy. Have you put plans for it on your site? 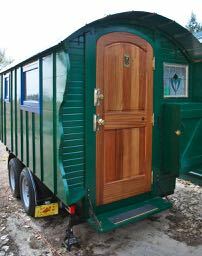 If you had to do it over again, would you really add a couple of feet to the vardo? I’m in the drawing phase and considering a 5′ x 10′ but I’m concerned about weight. Have you weighed the “Green Diamond” yet? I waiver about the extra two feet. It would be nice, in a cold environment, to have some extra floor space. For one person it’s fine, two can be a squeeze. I think there are explanations for this on the Vardo page and elsewhere. The bed is about 37″ wide and pulls out to be 11″ wider. Maybe a couple photos will help. 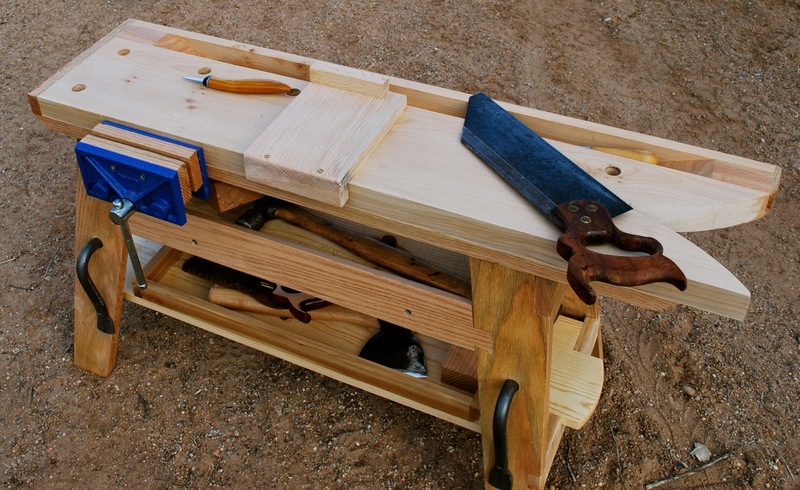 Just curious if there are plans for this little bench published anywhere as I’d like to make it as my first workbench? Just what you see here. There are a lot of examples of “saw benches” of this ilk out there though. I’m sure you can gather enough info to make one without any problems. Good luck. Send photos. How are the legs of the sawbench connected? I’ve obsessed over building this little bench for two+ years now. Any chance you can just flip it over and take a picture for me? Thank you! Thank you! I see the offset to not split anything. The strips in there are screwed down to the legs with the stainless screws you mentioned I would bet. Making mine four feet long. Looks like yours is about that guessing by it being 22 inches high. Yes, yes, and yes. Good luck on yours. Send pictures if you want.